Our continuing CEOs Talk Workplace series has given us the following unique insight on the importance of CEO presence in instigating workplace change. The decision to change, relocate, reposition, or consolidate workspace usually begins in the C-suite. The motivation could be organizational changes, lease expiration, overhead cost containment, shifting corporate initiative, employee engagement concerns, corporate ownership changes…the list goes on. Whatever the reason, the resulting decision triggers a series of events and activities that have a considerable impact on the entire company. How the CEO manages this varies and may have a significant effect on the success of the project as a whole. Photo courtesy of Paul Bence via Unsplash. Many articles on stress in the workplace cite that the impact of change on employee engagement and happiness starts from the top. CEO presence can make or break the eventual success of any workplace design project. One of the top ten stressors in life is moving. Although most commonly thought to be changed in residence, changes in workplace location can also be incredibly anxiety-producing, especially if the reasons for change and how the changes will be implemented are not well communicated across the entire organization. Nothing will start the rumor mill faster than when people see folks walking around their office with floor plans, taking photos of conditions, or documenting workstation occupancy. The theme music from Jaws might as well be playing in the background. A lack of communication may derail any executive efforts to send positive messaging about upcoming workplace changes. Smart CEOs are aware and understand the impact of workplace change, and pro-actively engage the right teams to shepherd them through the process. Coordinating messaging that prepares employees for why and how the changes will occur, how could participate in the process, and keep them updated on an overall timeline, help set expectations and assist in managing the planned changes. When CEOs have a personal vision and passion regarding the design of a new space, communicate this directly to the entire company early and often, and are open to dialogue and input from employees, the net result is overwhelmingly positive. When changes are not properly introduced or communicated, and there is little employee engagement, the prospects for project success are diminished. Although communication from the top is critical, the commitment of management structure and the trickle-down effect is also vital. When CEOs and upper management take an active part in instigating workplace change and then consistently participate in the planning process, the whole vibe around the project can change. The ambient attitude can morph from an exercise in swimming among the sharks to more of a relaxing day at the beach. Working in an atmosphere of anticipation rather than dread can yield not only a better design but a better chance for employees embracing the changes. Interactive visual displays throughout EY’s new Tyson’s Corner, VA facility – Image by WDM. The proactive management of the coming changes in phases prepared the staff for the move and lessened the culture shock of the transition from more a traditional space to the new open, shared workspace concept. One of the best lessons learned from all of our CEO interviews is the importance of getting ahead of the curve by promoting the changes in advance, and clearly articulating why the changes are being made. This is the best way to navigate all the complex issues associated with a workplace relocation or renovation. Throughout Sodexo’s office are ‘living labs’ that demonstrate what they can do for their clients. Image courtesy of Sodexo. PenFed’s space is a collaborative hub flooded with daylight and linked to the floor below by an open stair. Image courtesy of PenFed. Most of the CEOs we have interviewed have not implemented a specific set of metrics to measure space performance quantitatively. However, there seems to be universal consensus that their improved work environments have provided a space that increases employee performance and productivity, and is a significant tool to recruit and retain talent. Studies including Haworth’s 2017 study point out that there is a definite correlation between work environment, employee engagement, and the resultant benefits to companies that embrace design as a tool to achieve their business goals. 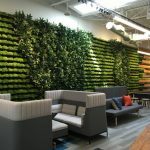 Our observations as we continue our CEO Talk Workplace series display that these goals are achievable especially if the pursuit of better design solutions, specifically tailored for their culture and employees, starts at the top. Interested in seeing who we interview next? You can continue to follow our CEOs Talk Workplace series through a free subscription to our weekly newsletter here! Want a winning workplace strategy? Dive into the occupancy data.